Home » Elections » How is the Trump Campaign Spending its Money? 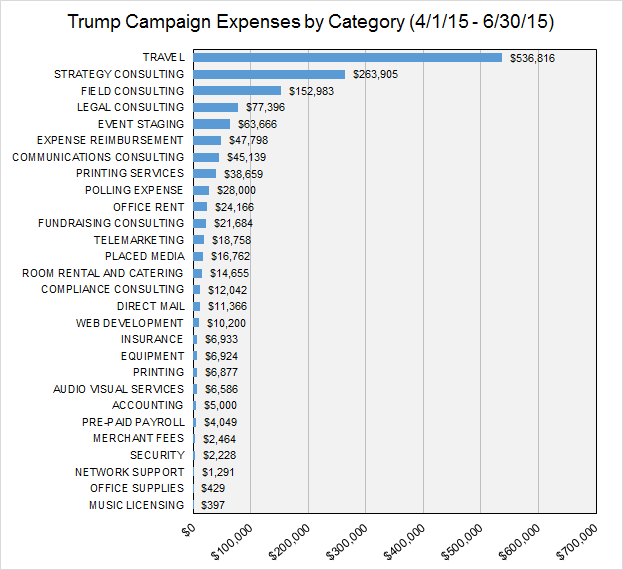 How is the Trump Campaign Spending its Money? On July 15th, the Federal Election Commission released the first batch of quarterly financial disclosure reports for the 2016 presidential campaigns. I have gone through the data, and it came as no surprise that one campaign’s financials looked very different from the others. Here are a few of the interesting pieces to come out of the Donald Trump Campaign‘s financial disclosures. Where is the Trump campaign spending its money? As of the reporting date, the Trump Campaign had spent a total of about $1.4M. a $506,486 expense to Tag Air, Inc. – a private airline owned by Donald Trump. In total, at least 38% of the Trump Campaign’s $1.4m of expenses was paid to Trump-affiliated entities. Another interesting tidbit from the expense report is a series of three $10,000 payments to an entity called Drake Ventures LCC, which according to the Florida Secretary of State is managed by a man named Roger Stone. Here is a Fox News clip from last Monday in which Roger Stone appears as a “libertarian political strategist,” to defend Donald Trump’s recent comments about John McCain. As pointed out by MediaMatters, both Stone and Fox News seem to omit the fact the he is on Trump’s payroll. Where does the Trump Campaign eat while on the road? The Trump Campaign expense report lists 19 items in the category of “Travel: Meals,” 8 of which are from McDonald’s. 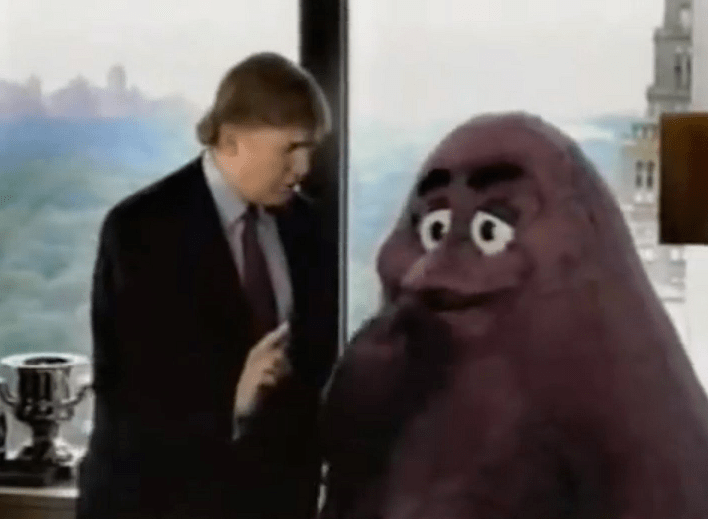 At first, I thought maybe there is one Trump staffer who just happens to really like fast food. But after checking the McDonald’s menu prices in Iowa (where most of the food was purchased), that seems unlikely. Considering these expenses appear to cover only May and June, and then only those days when the buyer was traveling, that would seem to be a massive amount of fast food for just one person. How is the Trump Campaign funded? And for the most part he seems to have kept his promise. Of the $1.9M in campaign funds raised so far, $1.8M is listed as a “Candidate Loan” coming from Trump himself. The remainder, an additional $54,439, is listed as coming from 66 individual donors. If you want to go through the figures yourself, you can download the original data from the FEC website. You can also download my cleaned-up version of the data from here. Trump is just an egomaniac looking for attention.